The Cougars represented MN well at the NHSCA High School Nationals in Virginia Beach, VA this weekend. All the boys won at least one match in this very competitive tournament full of the nation’s best high school wrestlers! Congratulations to Caden Steffen on becoming a National Champion and All-American! 6 Cougars are representing Team MN in Virginia Beach, VA this weekend at the 28th Annual NHSCA National Wrestling Championships. Good luck, guys! Go Cougs & Team MN! ZM Wrestling State Champion t-shirts will be for sale from Bev Prodzinski @ ZMHS this week! Shirts are $15 each or 2 for $25. (Limited quantities – first come first serve; second order to be placed if necessary). 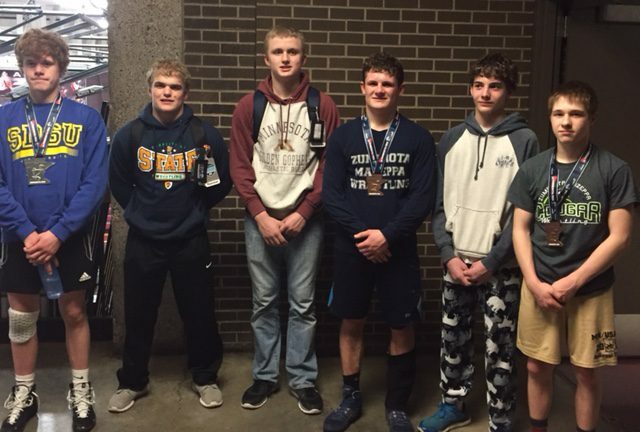 6 ZM wrestlers competed in the MN/USA Cadet and Junior State Folkstyle Tournament in Anoka on Saturday. Luke Tupper was runner-up at Junior 152, Sam Nordquist placed 4th at Junior 170, and Michael Majerus earned 5th at Cadet 106. Also competing were Tyler Soltau, Jack Haglund, and Cole Poncelet. Monday- Youth open mat/team practice at 6:00. Tuesday- Youth open mat/team practice at 6:00. Thursday- Youth open mat/team practice at 6:00. Sunday- NYWA Team Regions in Eyota. Over 1,500 wrestlers took part in the MN/USA Kids State Folkstyle Tournament over the weekend in Rochester. 5 ZM wrestlers were able to claw their way through the large brackets and earn a spot on the podium. Owen and Ryan Lexvold led the way each earning runner-up. Sam Moore was able to bring home the bronze medal. Isaiah O’Reilly and Ethan Kovars both placed 6th. Also competing were Cain Lexvold and Brennan Sheda. Congratulations boys! Friday- NYWA District Qualifier in Austin. Saturday- NYWA District Qualifier in Stewartville. Jr/Cadet State Folkstyle in Anoka. Please plan to join us tomorrow night after the individual finals in welcoming home our State Champion Cougar Wrestlers! Stay tuned, more details to come. This event will also be live-streamed on Facebook for those unable to attend!